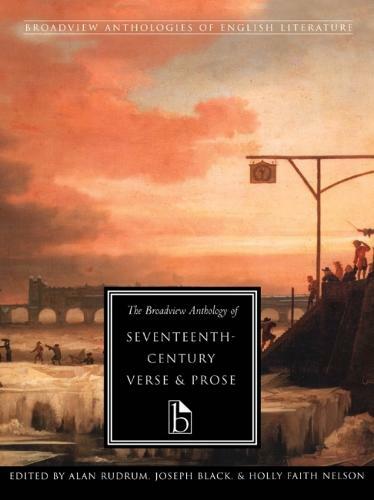 The publication of The Broadview Anthology of Seventeenth-Century Verse and Prose is a literary event; this comprehensive volume is the first anthology of the period to reflect the breadth of seventeenth-century studies in recent decades. Over one hundred writers are included, from John Chamberlain at the beginning of the century to Elisabeth Singer Rowe at its end. There are generous selections from the work of all major writers, and a representation of the work of virtually every writer of significance. The work of women writers figures prominently, with extensive selections not only from canonical writers such as Behn and Bradstreet, but also from other writers (such as Katherine Philips and Margaret Cavendish) who have been receiving considerable scholarly attention in recent years. The editors have included complete works wherever possible. A headnote by the editors introduces each author, and each selection has been newly annotated.